New York building superintendents don't like it when you make holes in their buildings. They are SUPER-sensitive that way. 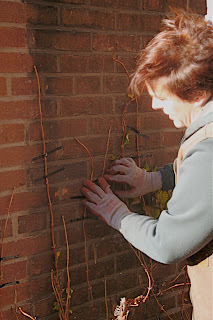 So what do you do when you want to train a vine up a wall? Pergolas and trellises need to be attached to the facade (requiring the dreaded "piercing of the building membrane"), and free-standing trellises (their bases planted in containers) aren't sturdy enough for woody perennial vines. I'm going to share my ingenious solution with you here. It's an excellent way to attach vines like Hydrangea petiolaris (climbing hydrangea) to buildings WITHOUT making holes in the facade or damaging the vine's stems. Can you say "Gorilla Glue"? Actually you need both Gorilla Glue AND Gorilla Tape. First, prep a bunch of tape strips, 3 inches long and 1/4 inch wide. You can tear Gorilla Tape pretty easily with your fingers. Next, apply glue to the portion of stem you want to attach to the building, about 1-2" long. 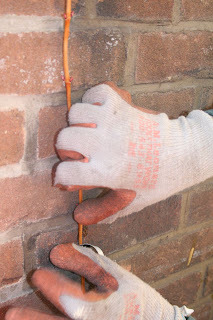 Press the glued stem against the wall and hold it in place as you tape the stem to the building immediately above and below the glued section. The tape looks funky, but it's temporary. Once the glue has hardened (about 24 hours) you can remove the tape. Gorilla glue poufs up, so you don't need to use much. If it's visible, creeping out from underneath the stem, don't worry. The extruding glue wears away with time (and a little bad weather) and next year's foliage will help mask any glue that remains after the winter. The glue bond holds for years, so it's a win-win-win situation. 3) Your super is happy (no holes in the building). Special thanks to Other Ellen for the photographs that involve my hands. She braved the wind and cold to help shoot this project! 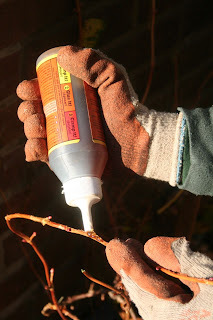 I tried this technique this past summer, and I found that the glue poisoned the vine and killed every branch that I used it on. Instead, I use vine supports, which are little plastic disks that you glue to the wall. A twist tie then goes through the disk and around the vine to hold the vine in place. Eventually the vine's natural tendrils start sticking to the wall as it grows into place. Search on amazon.com for vine support, $3.25 for a pack of 25. I first tried this in my own garden in June of 2005 and have had great success with climbing hydrangea, schizophragma, and trumpet vine. All three eventually took over climbing on their own, but needed help getting started on my concrete foundation. They're still thriving, more than 3 years later. What kind of vine did you glue and was it gorilla glue or some other brand? I'd like to try to figure this out.